Is a trip to the white continent on your bucket list? If so, it might pay to book ahead. It’s the ultimate once-in-a-lifetime trip. And while travelling to a destination as remote as Antarctica is never going to be cheap, many earlybird offers are now available. APT has deals on its 2018 Antarctic luxury expedition cruises. Two guests who book twin share on an Antarctica and South America tour of 23 days or more get one return economy flight from Australia free. Travellers can also choose to fly business-class return from Australia for $5495 per person. Two guests who book twin share on tours of up to 22 days get $500 air credit per couple. APT’s 10-night cruise on Le Lyrial travels from Argentina to the Antarctic Peninsula. 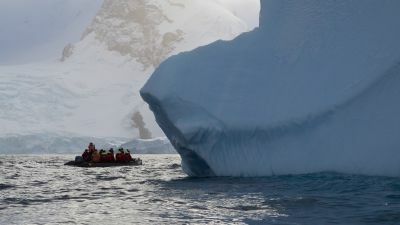 Once in Antarctic waters, an APT expedition team including naturalist guides and marine biologists lead daily zodiac excursions with no more than 10 people per vessel to see penguin rookeries, seal colonies and icefields up close. Antarctica is included on a number of APT South America itineraries departing in January and February 2018. The most popular is the 13-day Classic Antarctica trip, which includes two nights in Buenos Aires and is priced from $11,995 per person twin share. Abercrombie and Kent has earlybird discounts on its Antarctica voyages, also aboard Le Lyrial, for bookings made by March 31. The 17-day Antarctica, South Georgia and the Falkland Islands itinerary costs from $US17,995 ($24,476) per person twin share and the 12-day Classic Antarctica itinerary is from $US11,995 per person twin share. Adventure specialist World Expeditions has a 26-day voyage tracing the journey of Sir Douglas Mawson along the remote east-Antarctic coast. It costs from $US16,000 for a main-deck room twin share, and departs from Invercargill, New Zealand. World Expeditions is also offering savings of up to $US10,000 on two departures of its Ross Sea Explorer voyages. The first cruises from January 13-February 15 from Argentina and costs $US19,950 per person for a quadruple porthole cabin. There’s also a departure from Bluff in New Zealand from February 15-March 17, which costs from $US17,450 per person for a quadruple porthole cabin. Bentours has earlybird discounts on Hurtigruten’s Antarctic tours for departures from January 1, 2017, through to March 31, 2019, for bookings made by December 31. The tours of South America and Antarctica include the 20-day White Christmas in Antarctica, from $14,863, and the 14-day Frozen Land of the Penguins itinerary, from $10,005. Luxury line Seabourn has also expanded into Antarctica. Its Antarctica and Patagonia Experience on board the lavish Seabourn Quest includes a zodiac landing each day to selected Antarctic locations. It has departures on January 12 and February 2. If you’ve less time or want to avoid a sea voyage, Antarctica Flights offers a one-day sightseeing flight over the white continent. It takes around 12 hours, no passport is required and you can keep warm inside the Qantas 747. A flight departs from Perth on Australia Day 2017 and costs from $1199.